Ten Ren's stainless steel canister holds approximately 12 ounces (340g) of loose tea leaves. For small or tightly rolled tea leaves, such as Pearl Jasmine this canister holds 1.2 pounds or 19.2 ounces. 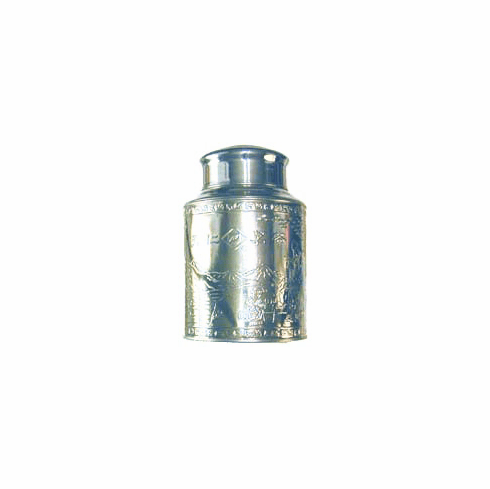 For large tea leaves, such as Pouchong, this canister holds 0.38 pounds or 6 ounces. The canister is about 8.0 inches (20.3 cm) in height and its base is about 5.25 inches (13.5 cm) in diameter. This canister comes with an inner and outer lid with an embossed scene of Lu Yu and pupil. Dimensional shipping weight is 1.5 lb.